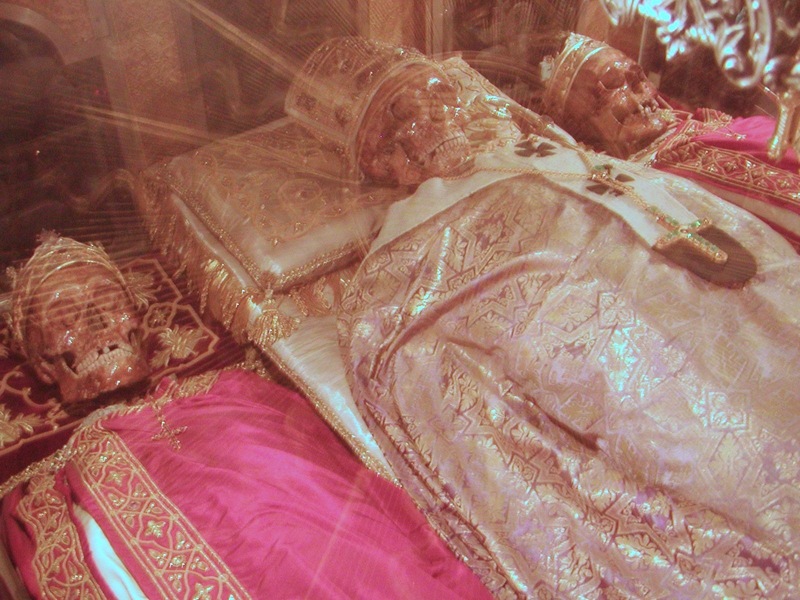 As reported yesterday in several Italian newspapers, a forensic analysis recently performed on the relics of St Ambrose has not only confirmed their authenticity, but also the accuracy of the most ancient portrait of the Saint. In a letter to his elder sister Marcellina (also a Saint), Ambrose speaks of an intense pain which he experienced in his right sholder, and difficulty of movement, caused by a fracture of the right clavicle which he suffered in his youth, and which never properly healed. 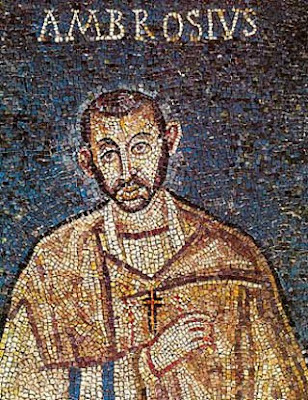 The presence of this fracture is confirmed by the examination of his skeleton, and, as explained by the head of the forensic team, Dr Cristina Cattaneo, accounts for the notable asymmetry of his face, as seen in this mosaic portrait of him from the early 5th century, in the chapel of St Victor in Ciel d’Oro within the famous basilica where his relics are kept. The Saint’s age of the time of his death is also confirmed, around 60 years old. Analysis was also performed on the relics of the Ss Gervasius and Protasius. In 386 A.D., St Ambrose uncovered the relics of these two Milanese brothers and martyrs, after having been shown the place of their long-forgotten burial in a dream. He had them brought to a newly-built basilica, then called simply “the Basilica of the Martyrs”, and laid in the place he had originally intended for his own burial; he also attests to the miraculous healings which accompanied the translation, as do his secretary, Paulinus, who would later write his Life, and St Augustine. Ambrose himself died on April 4th, 397 (which was Holy Saturday that year), and was laid to rest next to Ss Protasius and Gervasius; the basilica is now officially named after him. In the mid-ninth century, the abbot of the attached monastery placed the relics of all three saints in a large porphyry sarcophagus, which was later sunk into the floor and covered over; it was rediscovered in 1864 during a major restoration project, and the three bodies are now seen in the Confession of the church under the altar. The relics of St Ambrose, in the middle, in the white of Confessors, and Ss Gervasius and Protasius, in the red of the martyrs, to either side of him. Photograph by Shawn Tribe, from this article published in 2012. The forensic analysis shows that the two Saints were unusually tall for their era, about 5’10”, in their mid-20s, definitely brothers, most likely twins, since they suffered from the same congenital defect of the vertebrae, and have very similar faces. (This disproves the claims of some hagiographical skeptics that the skeletons were not those of two brothers, but that one was much older than the other.) One of them was decapitated, and has signs of injury on the ankle, the other was wounded on the hand with a small weapon of some sort.